A hiker’s and bicyclist’s dream, Greenwood Village is surrounded by both national and county park systems. Residents enjoy easy access to nearby hiking and biking trails that offer a variety of terrain from casual to challenging. In addition, about 100 acres of open spaces within Greenwood Village itself include hiking trails that access the trails in the Cuyahoga Valley National Park to the west and the Akron Bike and Hike Trail to the east. Trails in the Cleveland Metroparks Brecksville and Bedford Reservations are less than 3 miles from Greenwood Village. GVCA owns and/or maintains 50 Common Open Spaces, totaling about 100 acres, for the use and enjoyment of all the residents of Greenwood Village. These areas are open to GVCA residents and guests for their hiking enjoyment. 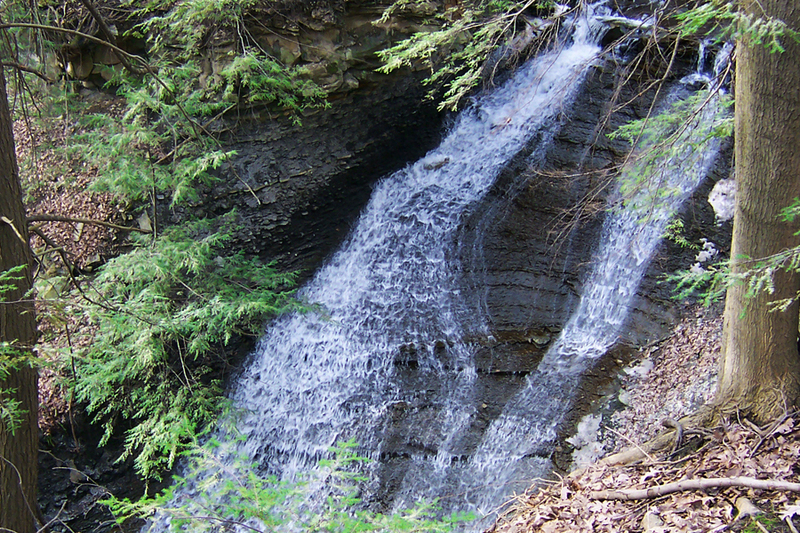 Most areas have been left in their natural state, with waterfalls, ledges, and canyons, so residents are advised to be cautious and use at their own risk. To see how all the trails connect, please check the GVCA Map. 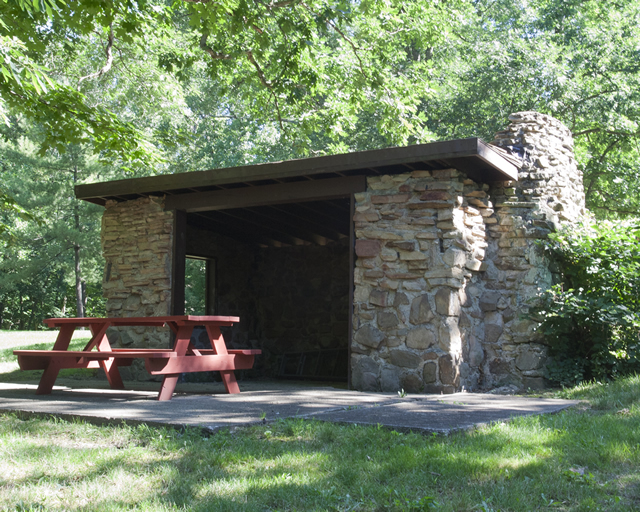 Years before Greenwood Village was built the stone cabin near Greengate Oval was used by Boy Scouts for camping and the name stuck. The concrete trail from the Boy Scout Cabin leads to a bridge over Rocky Run Creek and the 60-foot Greenwood Waterfall. While the waterfall is beautiful, please do not go near the edge of the canyon or the waterfall. Much of the edge is undercut and unstable, and the rocks can be slippery. Upstream, you will find a culvert under Greenwood Parkway tall enough to walk through. Past the culvert, you will find a small waterfall where the stream from Marshall Lake enters Rocky Run Creek as well as the remains of an old dam that washed away years ago. Further upstream, there is a beautiful rock canyon and a big tunnel where the creek goes under the Hike and Bike Trail. Do not go near any stream during a storm, as the current can be very powerful and dangerous. A good way to see these sights is join the Greenwood Outdoors group and go on one of their hikes through this area. Wear shoes with good traction that you will not mind getting wet. About 500 acres within the original boundary of Greenwood Village was purchased by the Federal Government and is now part of the Cuyahoga Valley National Park. As a result, one of the major trails through Greenwood was saved and preserved as the Old Carriage Trail. This 3.4 mile loop trail, ideal for hiking and cross-country skiing, winds down to the towpath trail along the old Ohio Canal before climbing back up to park rim. The trail has three bridges over canyons with beautiful views. 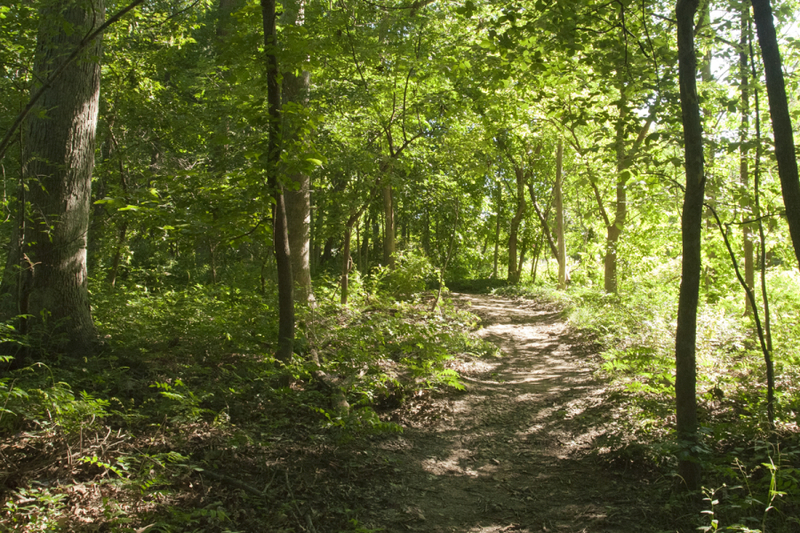 You can reach the Carriage Trail by walking through any of the GVCA Common Open Spaces adjacent to the Park, many of which have connecting trails. 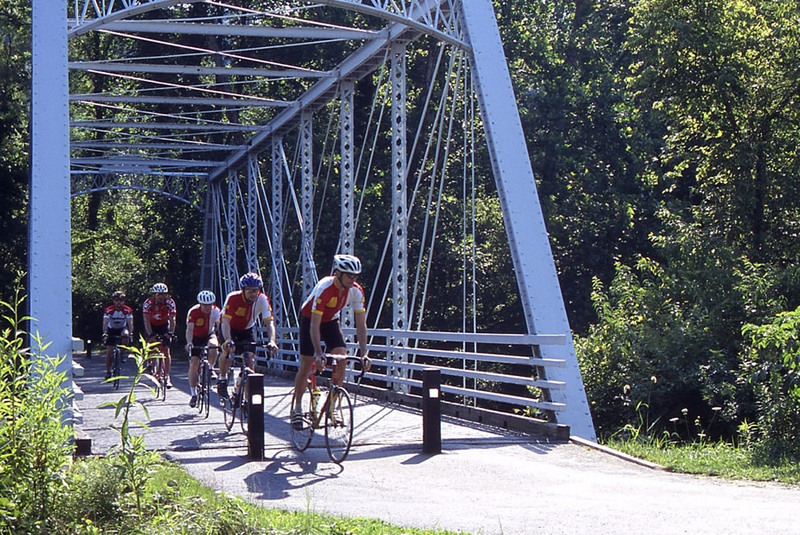 The portion starting at the end of Holzhauer Road is paved and open for bicycle use and connects to the Towpath Trail that runs along the old Ohio Canal. Please use caution and go slowly, as it is a steep grade down to the valley floor. The Towpath Trail follows the Ohio & Erie Canal along the Cuyahoga River from Cleveland to Akron through the CVNP. The surface of the path varies but is suitable for hiking and biking by people of all age and fitness levels. The path is accessible from the Holhauzer Road connector as well as some of the trails in the Greenwood Village common areas. The Old Station Road trailhead and parking area off of Riverview Road is the closest access point for users unwilling or unable to negotiate the steep up and downhill climb from Greenwood to the towpath. It is also a boarding area for the Cuyahoga Valley Scenic Railroad for excursions through the park. For a mere $2.00 bicyclists can bike the Ohio and Erie Canal Towpath Trail in one direction and return on the train with their bikes through the “Bike Aboard!” program. Greenwood Village is bordered on the east by the Summit County Metroparks Hike and Bike Trail, a converted railroad right-of-way. The paved trail connects with the Bedford Metroparks to the north and runs through the Virginia Kendall ledges and the cities of Stow and Kent to the south. 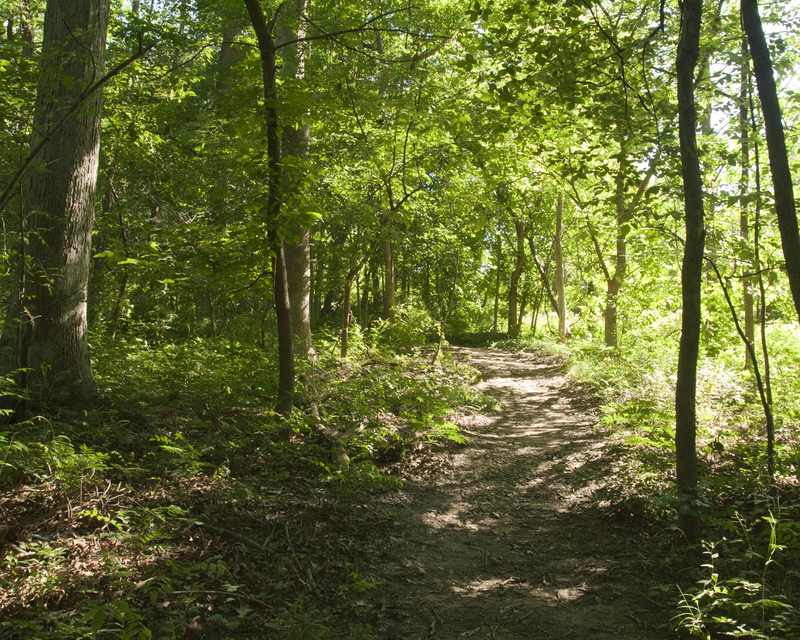 You can reach this trail from Holzhauer Rd., Route 82, or adjacent Common Open Spaces. GVCA maintains the trails on the Common Open Spaces. To see how all the trails connect, please check the GVCA Map. NOTE: Please do not trespass on Private Property to reach any trail or Common Open Space.